James Tucker passes on the news that he's expecting a very good collection of V8-powered machinery for the Dunlop V8 Supercar Challenge series, which runs at five of the EERC meetings this year. Two rounds of the Supercar Challenge take place at the end of season meetings, in November. Cars will be placed into one of three classes, depending on their horsepower and weight - the classes will be simply identified as Class 1, Class 2 and Class 3. The largest cars could include four newcomers to the British scene - plus a couple of familiar machines. Kelvin Burt is likely to drive one of the original SCV8 machines, a Peugeot that was seen at the Autosport Show in January. Andy Rouse should appear in another SCV8, the original Jaguar-bodied machine. 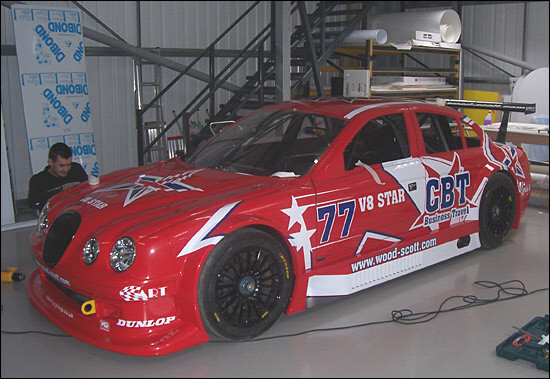 V8Star cars are expected from Wood-Scott Racing (the Jaguar that has featured here recently, below) and Nigel Mustill (this one Peugeot-bodied). Adam Sharpe Motorsport has offered one of its two Falcons for sale, but is bringing a third Falcon from Australia - so that completes a good selection of 'touring car type' machines - although there may even be a V8 Ford Focus running too. Potentially there are as many as five V8-engined BMWs being prepared, while the four Marcos Mantis that have been a regular feature of Britcar races in 2005 are all eligible for the V8 Supercar Challenge. Add in potential entrants running TVRs (a Topcats Sagaris? ), a Morgan and maybe even Corvettes, and the Dunlop V8 Supercar Challenge should pave the way for a full series of events in 2007. The regulations for all of the EERC-organised series are available on the www.eerc.co.uk website.